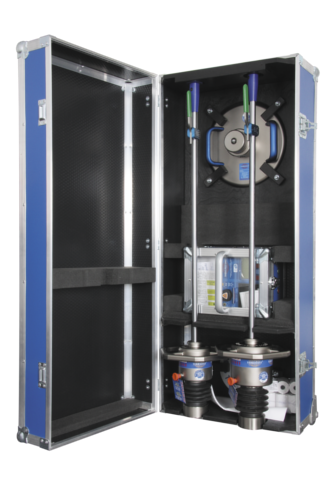 The Light Weight Deflectometer for the dynamic load plate test from TERRATEST offers a fast and simple method of testing soil bearing capacity and compaction qua­lity. As a specialist in Light Weight Deflectometers TERRATEST develops inno­vative measuring instruments based on the customers’ requirements in terms of performance, efficiency and construction site suitability. TERRATEST provides a complete, comprehensive range of products of Light Falling Weight Deflectometers for earth­works, road construction and track laying. 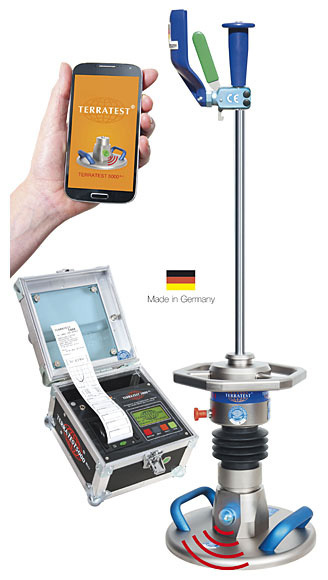 Light Falling Weight Deflectometers made by TERRATEST are in use all over the world. Over the years more than 2500 units have been put in place. They are being used in all continents of the world. 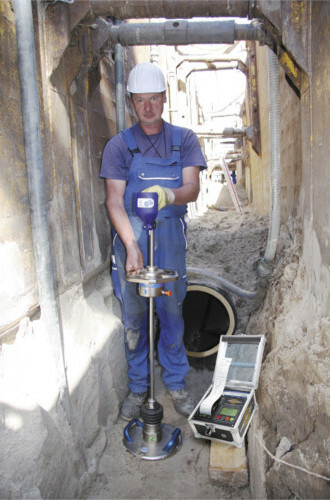 The special quality of our Light Falling Weight Deflectometers combined with our large product range and the high-quality of manufacturing have given us a high reputation among users: Whether with the German Army in Afghanistan, during urban civil engineering in Munich or while building the Bejing-Shanghai High-Speed Railway – wherever construction takes places, such as earthworks, road- or civil engineering, TERRATEST is highly valued for the high quality of the robust and precise Light Falling Weight Deflectometers. TERRATEST 5000 BLU is the first Light Weight Deflectometer in the world operating wirelessly via Blue- tooth. Thanks to its Bluetooth technology it is possible to control TERRATEST Light Weight Deflectometer by smartphone or tablet. 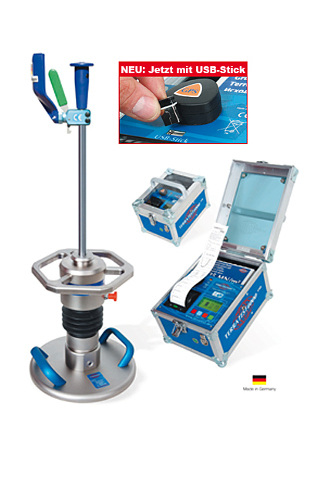 The Light Drop Weight Tester TERRATEST 4000 USB is fully equipped with all extras such as GPS system, printer, usb drive, high-performance rechargeable battery and PC software. All equipment is protected inside the weather- proof box “ROBUSTA”. On site you can operate TERRATEST 4000 USB via an external button, while the box is closed. Light Weight Deflectometer transportation box "ROMA"
In order to transport the two Light Weight Deflectometers 10 + 15 kg, TERRATEST provides the transportation box ROMA. Your test equipment will be protected wherever you go with the high-quality transportation boxes from TERRATEST. TERRATEST manufactures two models of the Light Weight Deflectometer for the dynamic load plate test: TERRATEST 5000 BLU works wirelessly; TERRATEST 4000 VOICE works with cable connection. Both are inside the weatherproof, fully equipped electronics box ROBUSTA. To protect the electronics from sand on site, you can operate the measuring computer of TERRATEST Light Weight Deflectometer via an external button. The measuring computer will be protected against dust and rain all over your construction site. 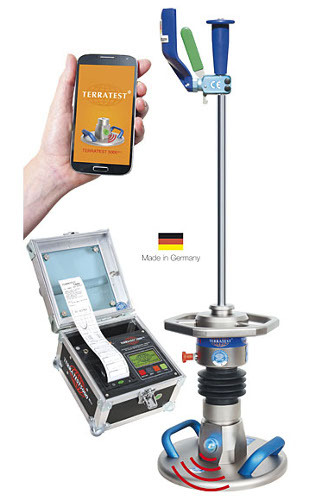 TERRATEST provides a wide range of accessories for the Light Weight Deflectometer for dynamic load plate tests, such as the mobile testing system CARRELLO or the transportation box MILANO.